The acting was really rather good. However, Pitt and Bergès-Frisbey’s characters had a tragic and elegiac quality; so much so that it was, at times, annoying. The writing was mostly decent, but sometimes it seemed like it was trying really hard to be mysterious and avant-garde that just came across as vague and tedious. There’s really only 4 characters in this film. The main character is, shocker, a blond, white male. The supporting characters are a blonde, white female, a French female (played by a Spanish actress), and a Korean male (Glenn from The Walking Dead!!!!!!). Bergès-Frisbey’s character is jealous, meek, and flighty (you know, just your stereotypical woman). I really loved this aspect. Ian’s hair was a mess throughout, though I suppose that was supposed to give him a sort of “mad scientist” vibe. But I loved Sofi’s wedding dress. If only the story was that simple. In order to give a good enough explanation of the story, I feel like I must synopsise it in full. SPOILERS FOLLOW!! 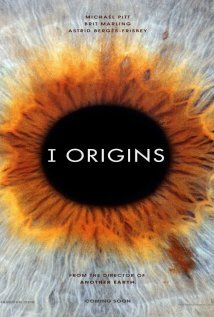 Karen (Marling) spends half the movie trying to discover the origins of the human eye. Meanwhile, Ian (Pitt) spends that time fawning over Sofi (Bergès-Frisbey). Ian and Sofi are the epitome of star-crossed lovers: he’s a molecular biologist who believes that his study of the human eye will give concrete evidence to the non-existence of God; she’s a spirited girl who believes unapologetically in the existence of God and the spirit world. Despite these opposing beliefs, they are practically inseparable, and they both feel that they have always known each other. Sofi believes it’s because they have been lovers in past lives, and Ian believes it’s because their atoms have always known each other since the beginning of time. After only a short time together, they decide to get married, but the courthouse says they have to wait 24 hours after they fill out the paperwork. So, instead, they go to Ian’s lab where Karen has just discovered the origin for the human eye. Afterward, Ian and Sofi go back home, but they get stuck in an elevator, where they proceed to get into an argument about how irresponsible Sofi is. Ian manages to climb out of the elevator, but just as he’s almost helped Sofi out, the elevator breaks and falls. They think they’re safe, but then Sofi becomes unresponsive. He feels down below her and his hands come up sticky with blood. Sofi’s legs have been severed just below the waist, and she is dead. It cuts to seven years later, where Ian and Karen are now married and expecting a child. The evidence that they have uncovered (or rather that Karen has uncovered and Ian has taken full credit for) are now used to keep track of people. People volunteer to get their eyes scanned, and I don’t really understand why, other than it helps the plot go forward. When their son is born, they agree to have his eyes scanned. But the system comes up has already having that eye registered to a man named Edgar Allen Dairy. The nurse reboots the system and is able to enter baby Tobias’s information into the system. The nurse calls them a little while later and explains that, through the scanning of his eye, they have discovered that Tobias has early evidence of autism and would like to do further tests on him. They consent and Tobias is shown a series of pictures, two at a time, to see which one draws his attention. The two most notable are a picture of a diner in (fantasy version) Boise, Idaho and a picture of an elderly black lady. He stares at both of these pictures instead of their partner, and even begins crying when he sees the lady. Ian and Karen do some research and discover that the diner is a real place (even though it’s not, and neither is the Boise that they go to… some tiny farm town where only a couple hundred people live…. but anyway…) Ian inquires about Edgar Allen Dairy, and the waitress points him into the direction of a dairy farm. When he gets there, he is greeted by a young woman who is tending some cows. He inquires about Edgar Allen Dairy and she gives him some vague answer that isn’t really an answer at all. And then, her mother comes over to them and lo and behold! it’s the lady who’s picture Tobias was staring at. It turns out that she was Edgar Allen Daily’s wife. So it would seem that Tobias is Edgar Allen Daily reincarnated, and the evidence is all in his eyes: he has the exact same eye as Daily, even though it’s a different colour. Ian decides to have all the pictures he’s taken of people’s eyes into the system (for I don’t know what purpose other than to further the plot…) Karen suggests that they scan in Sofi’s. But Sofi’s eyes are already registered, but this is impossible because Sofi died seven years ago, long before this technology existed. Ian travels to India where Sofi’s eyes were registered and meets a 7-year-old girl who has the exact same shape and pattern of the iris that Sofi had. Together, he and Karen perform the same picture recognition test on the little girl that was done on Tobias. But while Tobias aced the test, the little girl only correctly recognises about half of the things from Sofi’s life. Just when Ian is about to give up hope that this little girl could possibly be Sofi reincarnated, the little girl freaks out when the door to the elevator opens. And then, Ian knows that it is Sofi. And the film ends. Nothing is really answered in this film, though I feel like the director/screenwriter was trying to prove the existence of God with the whole reincarnation thing (even though most religious people I know don’t believe in reincarnation). But who knows, the filmed seemed to be going in a bunch of different directions, and was therefore a little convoluted. The first half of the film took too much time, and yet didn’t take a lot of time at all.